WHAT DOES PAINT THE TOWN PURPLE MEAN? 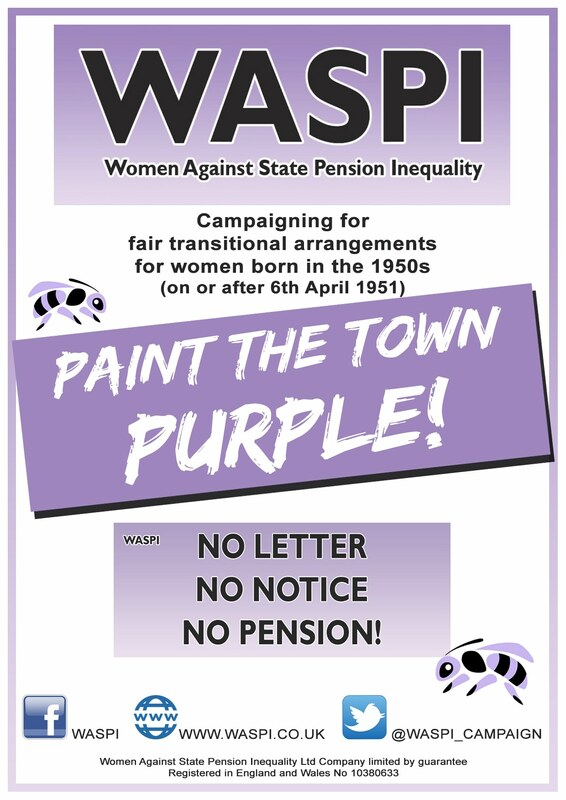 This is an united country wide WASPI campaign to raise awareness of 1950s women’s state pension issues, so that everyone knows what the WASPI campaign is and what it is doing. It’s a way of all the groups making the same statement in their own areas and beyond, and a great opportunity to find new members for your group. Plaster our posters all over the neighbourhood: your own front window, local shops, co-op supermarkets, vets, doctors’ surgery, citizen’s advice bureau, village hall, recreation centres. Supportive MPs might post it in their newsletter. Local newspapers and free door to door magazines like the parish magazine or Village People etc. might feature it. Posters at every local event: Christmas Bazaars, dog show, residents’ meetings, etc. Wear purple with our WASPI sashes. WHAT DOES WASPI AIM TO ACHIEVE WITH THIS CAMPAIGN? We want to get our brand out there, so that everyone knows what it is and what we stand for. Our aim is that if you ask anyone, young or old, male or female, what the WASPI campaign is, they will be able to tell you (unlike a Conservative MP who recently claimed he had never heard of us). 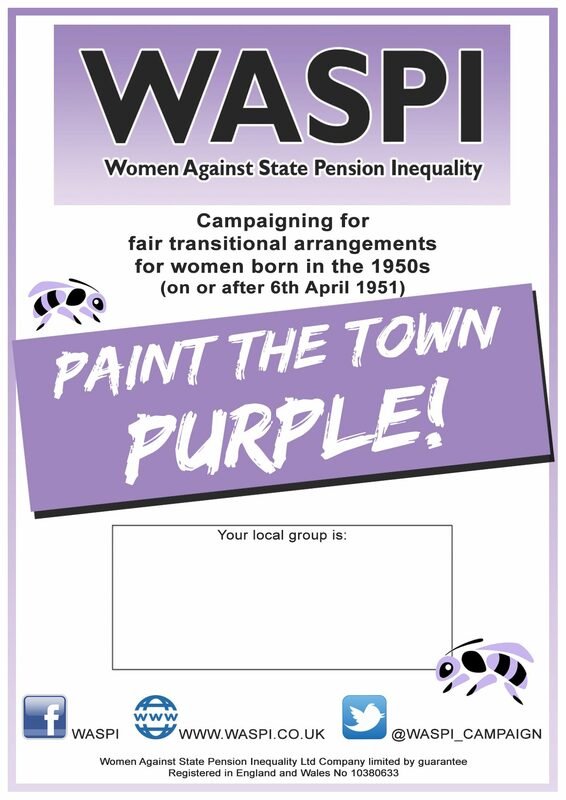 We want the sight of a purple poster or sash to bring the idea of WASPI 1950s women’s pension injustice to the forefront of everyone’s mind. WHAT IF I DON’T LIVE IN A TOWN? You can promote the campaign in the smallest hamlet or largest city. It’s the collective, countrywide effort that will make the impact. WHY ARE THERE DIFFERENT POSTERS AND FLIERS? There are two different posters, one with the option to fill in your local group details and one with NO LETTER, NO NOTICE, NO PENSION, for use where a local group name isn’t relevant. These are for printing at A4 size. They can also be printed two to a page and used as mini posters or fliers and can posted on Facebook or Twitter, and on local Streetlife websites.